Hi Wolfgang Amadeus Mozart (ginbunyagan komo Johannes Chrysostomus Wolfgangus Theophilus Mozart; Enero 27, 1756 – Disyembre 5, 1791) usa nga masinuraton ngan duro ka impluwensyal nga Austryako nga kompositor hin Europeo nga klasikal nga musika. An iya dako nga ginpagawas nga mga sobra unom ka gatos nga mga komposisyon naglalakip in mga sinurat nga kilalado nga mga gihataasi in kalidad nga simfoniko, chamber, piano, operatiko, ngan choral nga musika. 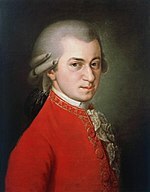 Hi Mozart usa han mga sikat ngan popular nga mga Europeo nga klasikal nga mga kompositor, ngan damo han iya mga sinurat kabahin han standard concert repertory. Eisen, Cliff; et al. "Mozart". Grove Music Online (ginkikinahanglan hin subscription). Ginkuhà 15 September 2010. (Inaleman) Haberl, Dieter (2006). "Beethovens erste Reise nach Wien: die Datierung seiner Schülerreise zu W. A. Mozart". Neues Musikwissenschaftliches Jahrbuch (14). OCLC 634798176. Heartz, Daniel (2003). Music in European Capitals: The Galant Style, 1720–1780 (1st ed.). New York City: W. W. Norton & Company. ISBN 0-393-05080-7. OCLC 50693068. Lorenz, Michael (9 August 2010). "Mozart's Apartment on the Alsergrund". Ginkuhà 27 September 2010. March, Ivan; Greenfield, Edward; Layton, Robert (2005). Czajkowski, Paul. ed. Penguin Guide to Compact Discs And DVDs, 2005–2006 (30th ed.). London: Penguin. ISBN 0-14-102262-0. OCLC 416204627. Mozart, Wolfgang; Mozart, Leopold (1966). Anderson, Emily. ed. The Letters of Mozart and his Family (2nd ed.). London: Macmillan. ISBN 0-393-02248-X. OCLC 594813. "Mozart, Mozart's Magic Flute and Beethoven". Raptus Association for Music Appreciation. Ginkuhà 27 September 2010. Sadie, Stanley, ed. (1998). The New Grove Dictionary of Opera. New York: Grove's Dictionaries of Music Inc.. ISBN 978-0-333-73432-2. OCLC 39160203. Eisen, Cliff; Sadie, Stanley. "Mozart, Wolfgang Amadeus", in: The New Grove Dictionary of Music and Musicians, 2nd edition, vol. 17, ed. Stanley Sadie, Oxford University Press, Inc., New York, 2001. ISBN 978-0195170672. Steptoe, Andrew (1990). The Mozart-Da Ponte Operas: The Cultural and Musical Background to Le nozze di Figaro, Don Giovanni, and Così fan tutte. Oxford: Clarendon Press. ISBN 0-19-816221-9. OCLC 22895166. "Award of the Papal Equestrian Order of the "Golden Spur" to Wolfgang Amadeus Mozart". Vatican Secret Archives. 4 July 1770. Ginkuhà 27 September 2010. Wakin, Daniel J. (24 August 2010). "After Mozart’s Death, an Endless Coda". The New York Times. ISSN 0362-4331. http://www.nytimes.com/2010/08/25/arts/music/25death.html. Mozart, Wolfgang (1972). Mersmann, Hans. ed. Letters of Wolfgang Amadeus Mozart. New York: Dover Publications. ISBN 0-486-22859-2. OCLC 753483. "New Mozart Pieces Unveiled (Video)". The Huffington Post. 8 February 2009. Ginkuhà 29 September 2010. Ini nga pakli kataposan nga ginliwat dida han 08:14, 14 Enero 2015.